Good morning everyone! It's hump day...one day closer to the weekend. 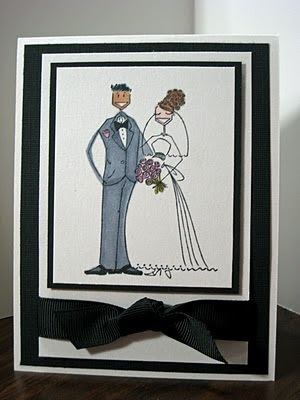 Todays card is a simple but elegant wedding card I made for one of John's co-workers. 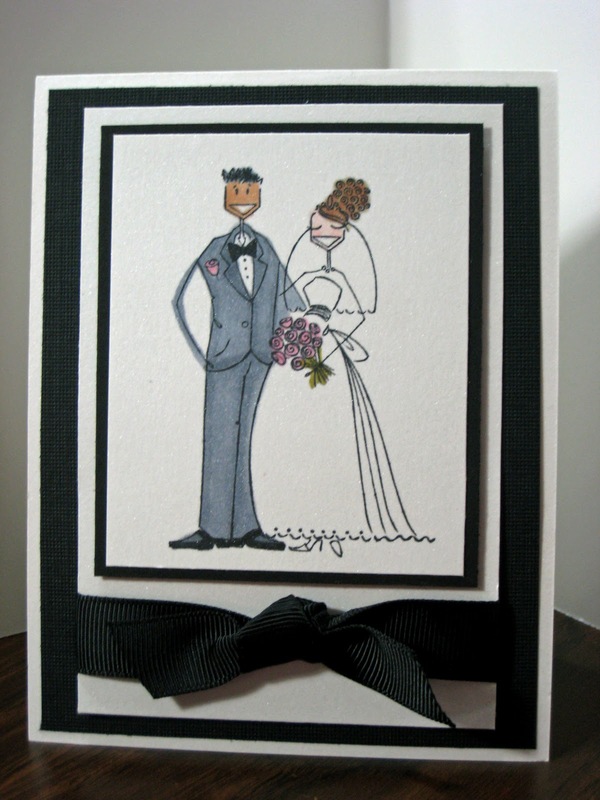 I love the classis black and white and the sparkle of the shimmery white cardstock adds a nice finishing touch to the elegance. I used my copic markers to color thie image and I'm finally getting the hang of the blending. It took a while but it's coming along nicely. Posted by Karen at 6:37 AM 4 Click here to leave me a comment. Hello everyone! This is my card for the Weekly Color Challenge. This weeks color is Pumpkin Pie. I am definiately not a fan of orange but it goes great with last weeks Old Olive color! I used my Copic markers to color the flowers and distressed the edges and added a little shading around the edges. I am almost done with my album for hire and then I can get back to the everyday stamping. Don't forget May 1st is National Scrapbook Day! Will you be croppin? Posted by Karen at 6:58 AM 1 Click here to leave me a comment. The more I use this set, the more I really like it. I like how the outline doesn't have to be perfectly lined up with the solid pieces! You can also use just the solid or outlined images! there are 18 stamps in this set! Lots of possibilities here!!! Awash with Flowers will be in the new catalog but you can get it early by emailing me for details or checking out the Stampin Up website from the link above! Posted by Karen at 9:18 PM 1 Click here to leave me a comment. Hello everyone! I hope you had a great weekend. It was girls night around here and I had four friends over Friday night to crop and spend the night. We had a little cookout and went right to work cropping the night away! I did miss stamping though! My color challenge for this week is Olive Green. I absolutely love this color as it goes with so many other colors and some you would never even think of! I chose Barely Banana and Tempting Turquoise! I love the two step bird punch and use it as often as I can! This card has alot going on but I love all of the layers! Posted by Karen at 9:11 PM 1 Click here to leave me a comment. Hello everyone! I often take my leftover scraps and put them in a box to save for future use. I opened my box of scraps and pulled out these two patterned papers (that is about all that was left) and said what can I do with these to make a card. Here is the final product. 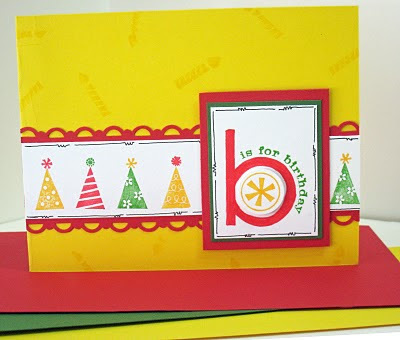 Lots of layers and my favorite Simple Letters from Stampin Up. The arrow is also a sizzix die and I threw in some old olive ribbon. Don't throw away those scraps! Keep them in a box or envelope and pull them out and see what you come up with! Posted by Karen at 6:50 AM 4 Click here to leave me a comment. Now that income taxes are behind me that's one less worry to get done so I can get back to the serious business of STAMPING! 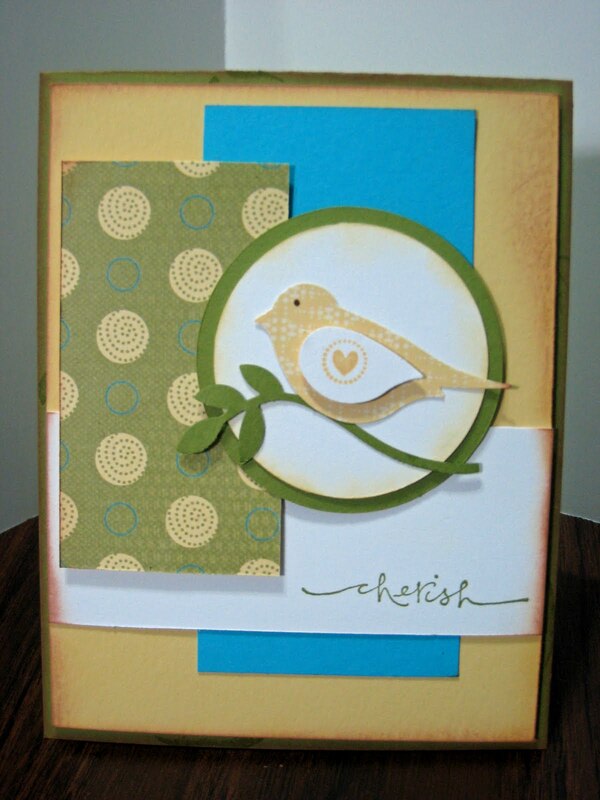 :) Todays card was inspired by Karen Giron's weekly sketch challenge. I really like this sketch as it has a lot of potential! I chose to do my card in a 4X4 format. It makes a great size gift card. I love the look of the pink and brown...it's classic! 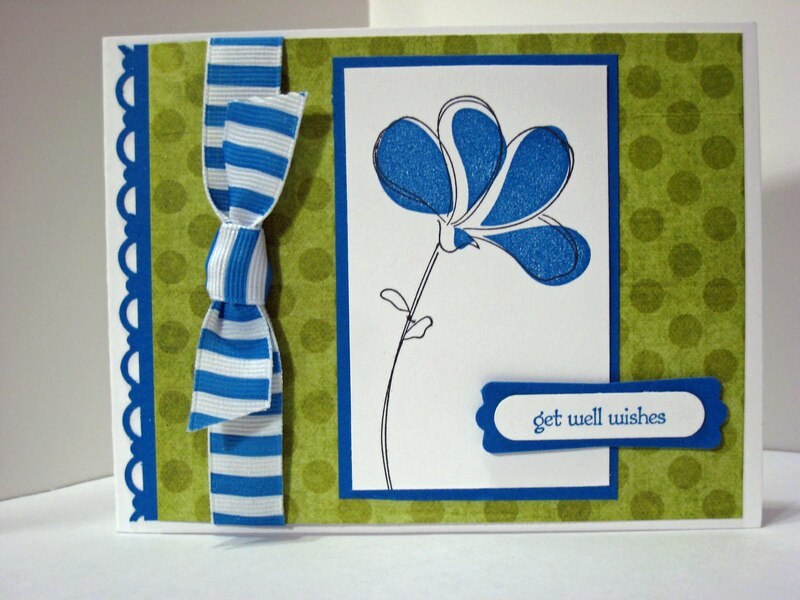 Check back tomorrow for a card made wth the Awash with Flowers! It's a great set! Posted by Karen at 8:27 PM 2 Click here to leave me a comment. Please keep Ethan and his family in your prayers! Posted by Karen at 9:47 PM 0 Click here to leave me a comment. 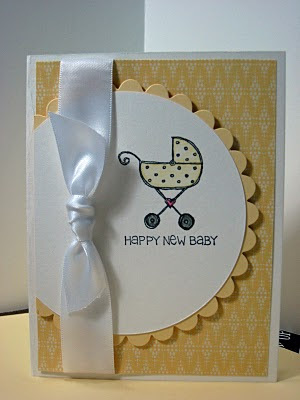 When I received a request for a baby card I had to stop and think I do have baby stamps don't I? Then I remembered this cute little baby buggy stamp that came in the Fun and Fast Notes which I selected as part of my demo kit for Stampin Up! I love this set but I did separate my words from the image so I could mix and match the sayings and it works well. Posted by Karen at 6:56 AM 3 Click here to leave me a comment. When Stampin Up announced we would be carrying the Smooch Spritz I was excited. 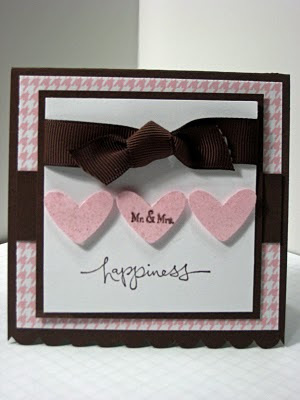 I love the Shimmery White cardstock Stampin Up carries but with the Smooch, ALL of my paper can be shimmery! I purchased the vanilla and it is beautiful! It also does not tend to "warp" your cardstock like some other sprays I have used. I made this card for my neighbor who included my daughter on their Spring Break excursions! She LOVES skulls and the pink, black and white plus shimmer creates an awesome card. I used the grain stamp from the new Sweets Scoops set to resemble "zebra" stripes. I also sprayed the skull but it's not easily seen in the photo! You can order your Smooch in several different colors starting in May. It is definiately a must have so add it to your list! Posted by Karen at 9:07 PM 1 Click here to leave me a comment. Hello everyone! Hope your weekend is going well! 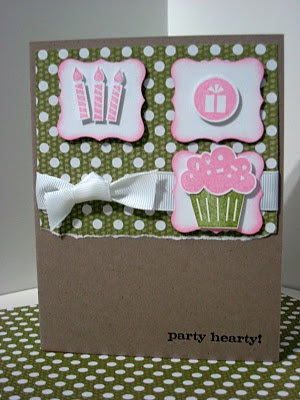 I have been inside stamping and playing with lots of new Stampin Up goodies that will be out in the Summer Mini catalog! Get ready as there are lots of new great "must haves"! Todays card uses the Watercolor Trio set. I hesitated getting the set but I used the Daisy set so much I figured I would use this one. I love the different stems and all you can do with them! 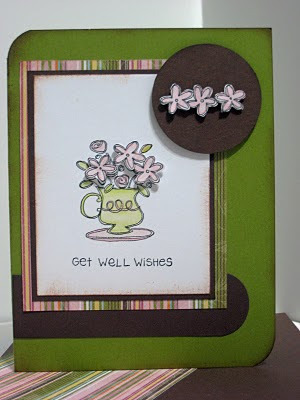 I used the sketch challenge from the Stamping 411 blog. It's a great sketch with lots of possibilities! Posted by Karen at 11:07 PM 8 Click here to leave me a comment. I miss all of you when I don't get go post every day! I have been finishing up income taxes and clearing out some old supplies and organizing so I can see what I have and use it! 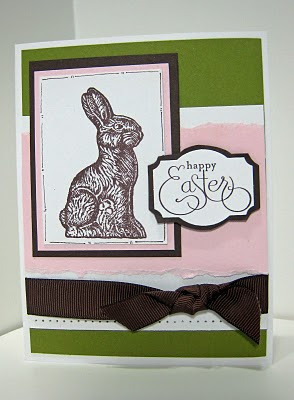 I did take a break to get this card made for the Stamping 411 Sketch Challenge this week. 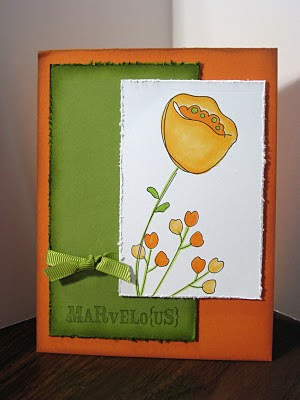 My card uses the Sweet Pea designer paper, some Old Olive ribbon and one stamp from the Three Little Words set! I used the extra flowers on the paper to layer over the ones on the paper. The ribbon makes a cute leaf. If you haven't tried one of the challenges, give it a whirl. It provides great inspiration! TGIF! Posted by Karen at 7:16 AM 3 Click here to leave me a comment. Hello everyone! I hope you had a wonderful weekend. We had a full plate but had a blast! 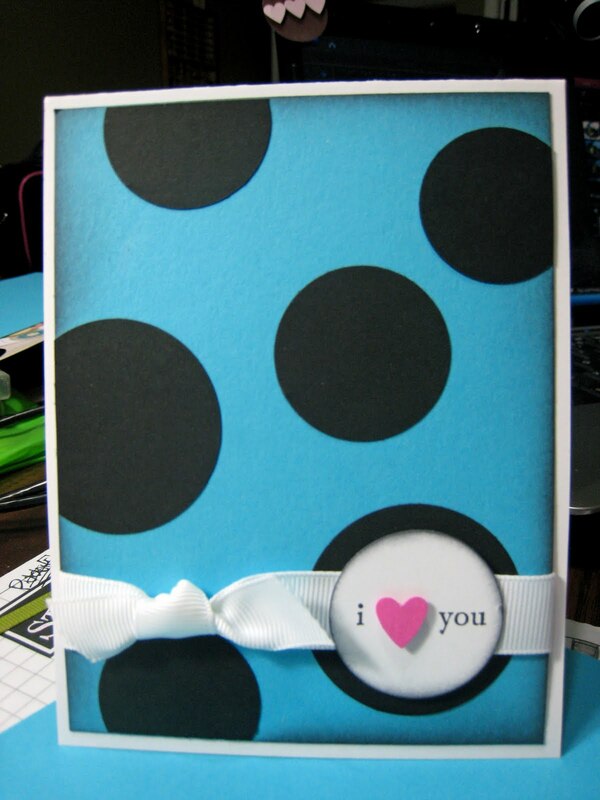 Todays card inspiration started with my weekly color challenge using Tempting Turquoise. This is a color I have not used alot but I really like it. I'm not sure where the layout of my card came from. I just started punching a few circles and before I knew it, it all fell into place. I really like the end result! Very stylish if I say so myself! 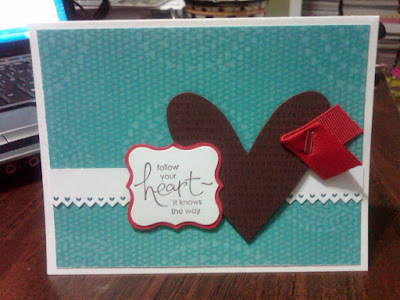 I stamped the I Love You from the Three Little Words set without inking the love and used a dimensional for the heart! On another note, you may have heard the news that Stamping Up is doing a little renovation! They have put together an awesome line up of colors dividing them into four categories. They have retired quite a few colors, brought back from of the old "In Colors" and will be adding new ones with the new catalog release in July. I will be posting a chart showing the new color line up. We will say good bye to some nice colors but the new collections really compliment each other. Posted by Karen at 9:22 PM 3 Click here to leave me a comment. It's been a busy week so I haven't posted every day but I managed to get this one in last night! I used a lot of dimensionals so it has several 3D layers. 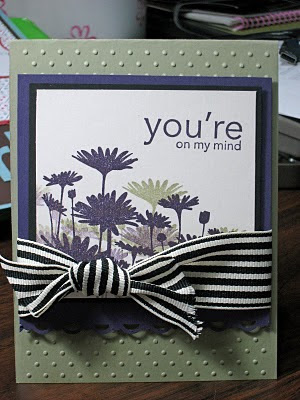 I ordered the black and cream ribbon from Stampin Up a while back and kept forgetting to use it so I that was one of the first things I went for to use on this card. I'll have all new products on Monday so be on the look out for sneak peeks of things to come! I can't wait to share them with you all. I hope to post again over the weekend but just in case I hope everyone has a blessed Easter and safe travels if you are on the road. Posted by Karen at 7:12 AM 3 Click here to leave me a comment. As March passes so does the fantastic products Stampin Up blew us away with for their Sale-a-bration this year! I have enjoyed making so many projects using these fantastic sets. If you missed any of them, hopefully they will turn up in the new catalog. The Spring mini items are still available but get them while you can as they are only available through the end of April! Expect new and exciting things in May as we enter the Summer mini. I will be showing you some sneak peeks as soon as I can along with a preview stamp set you can get before the new catalog comes out in July! Stay tuned! 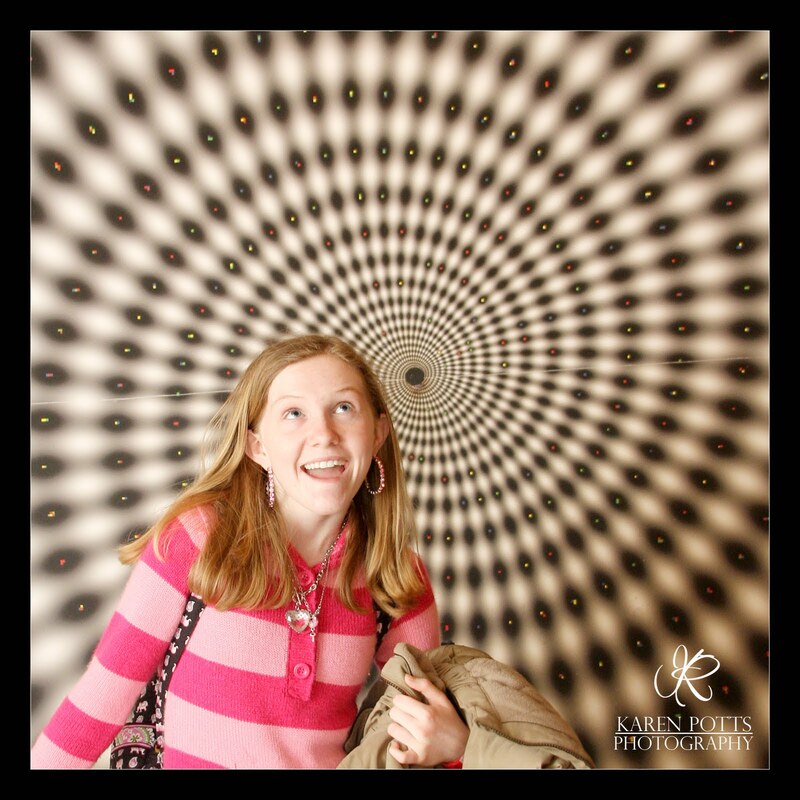 Here is a picture of Katie taken from our vacation in Tennessee. I thought it made me dizzy looking at it at Wonderworks but I think the photo is just as illusional. Here expression here couldn't be more right on! Posted by Karen at 7:09 AM 0 Click here to leave me a comment. Hello everyone! I hope you have had a wonderful weekend. It has been beautiful here in Northeast Florida the past few days...just the way Florida is supposed to be! I have been busy cleaning my craft table today. I have two 6 ft. tables and you could not see the top of either table so it was time to organize and put stuff away. I decided some had to go so I have cleaned out a few areas. Todays card is two challenges in one! The first is my weekly color challenge. The color of the week is Pink Passion. Those of you that know me know if it comes in pink I want it so pink is an easy color for me to work with. 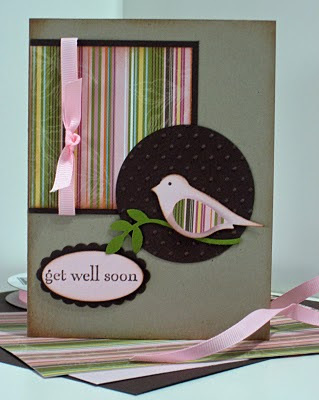 I used the sketch from the Stamping 411 blog weekly challenge. 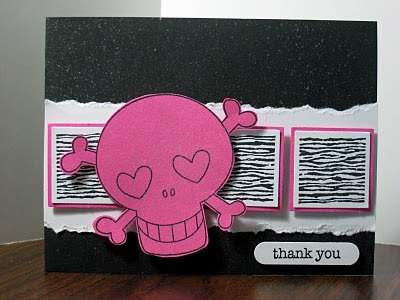 I pondered about the original sketch but I try to challenge myself to step outside the box and change it up a bit so rather than the straight line section, I cut and collapsed the Top Note Die stamped with the Very Vintage roller in Pink Passion. I have found the Top Note die to be very versatile when doing projects. You can use parts of it or the whole thing. Play around and let me know what you come up with! Posted by Karen at 8:27 PM 9 Click here to leave me a comment. Posted by Karen at 8:26 PM 3 Click here to leave me a comment. Every once in a while you gotta get out a little contraband! lol I have had the image on this card stamped for over a month and it just looks at me when I sit down to stamp. I started this card early this morning and when I came home and was trying to figure out what I was going to put on the card there was that cute little image with the buttons! 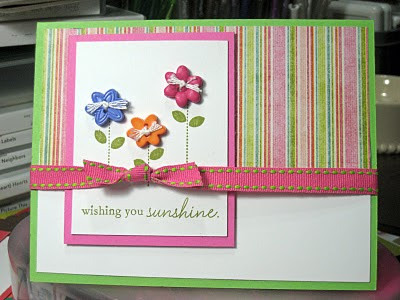 I love the little flower buttons and when I put this card together I couldn't believe how long it has been since I created something with PINK! How could I let that happen??? Leave a comment and let me know what you think! Posted by Karen at 8:03 PM 1 Click here to leave me a comment. Three challenges in one weekend! Here is the last of the challenges I completed this weekend. This one is from Karen Giron's blog. I used to make a lot of 6X6 cards because there was so much room for design but since postage has skyrocketed I hardly ever make them anymore. 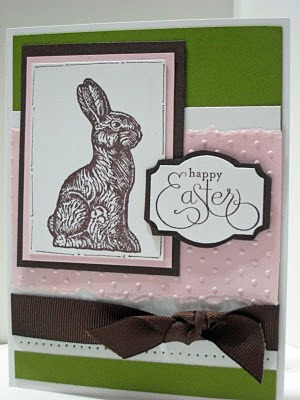 The rabbit was stamped on Shimmery White Cardstock using Chocolate Chip. I then used a dauber to "color" in the white space. That makes him a shimmery chocolate bunny! I used my scallop punch and stencilled the clouds in the background. I picked up this quick and easy technique from my monthly demo meeting this week. I hope everyone has a great week and beautiful weather! Posted by Karen at 9:30 PM 2 Click here to leave me a comment. This card was inspired by the stamping411 blog weekly challenge. I was hoping to get this posted yesterday but time got away from me with errands and commitments so here we go! 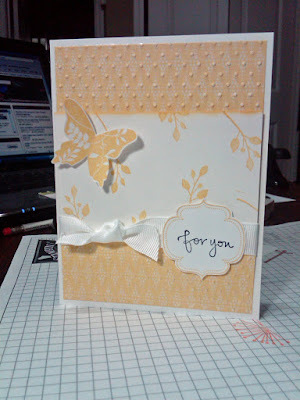 I embossed the background paper with the dots embossing folder. 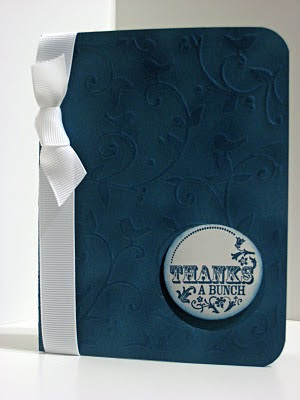 I love how the embossing adds that extra wow to your cards. 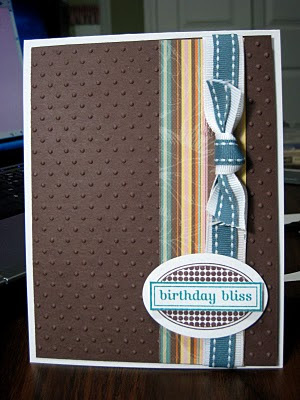 I stamped the birthday bliss twice and used dimensionals for the top layer. The ribbon was doubled for an extra layer. Posted by Karen at 8:09 PM 9 Click here to leave me a comment. 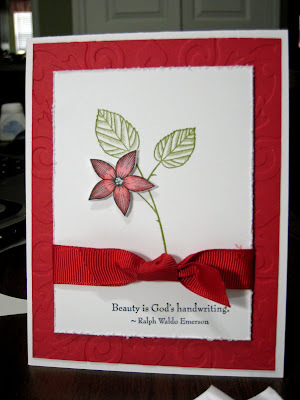 I used the God's Beauty stamp set and stamped the leaves in Old Olive and colored the flower with red prismacolor. I have been practicing with my knot tieing and they are beginning to look pretty good if I say so myself. I used the distessing tool around the edge of the white and embossed the background. I have a couple of sketch challenge cards I will be posting later today and tomorrow morning. Posted by Karen at 5:54 PM 2 Click here to leave me a comment. Hello everyone! 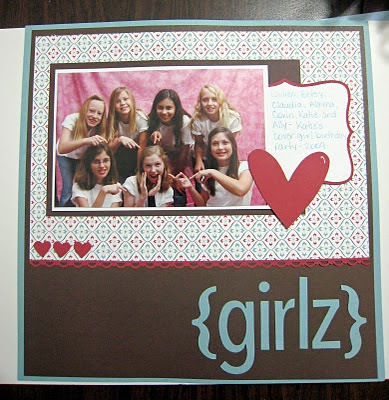 Today I am featuring a scrapbook page mad with Stampin Up products. 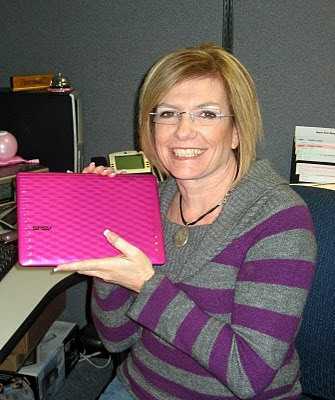 I have alot of people ask what Stampin up has to offer scrapbookers and believe me...It's alot! 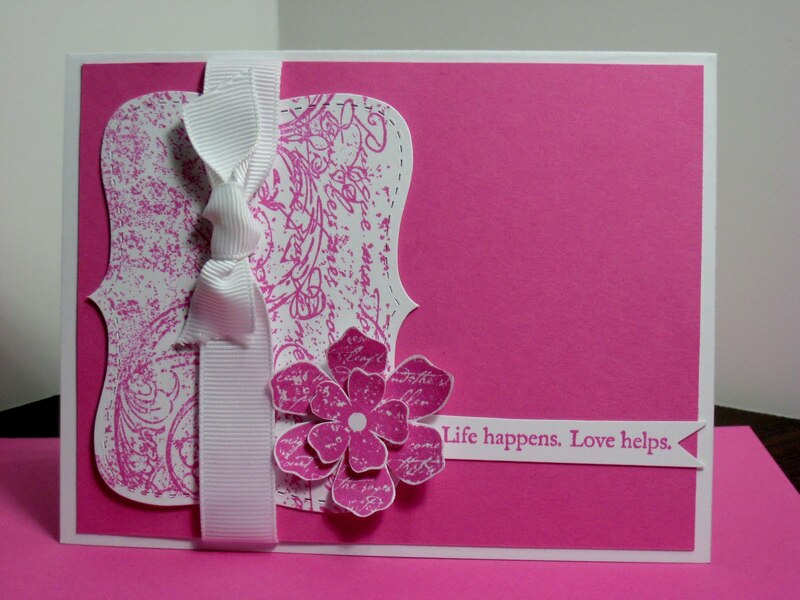 Stampin Up has exclusive dies you can only purchase through Stampin Up! The jounal box on this page is called the top note die! It is one of my craft room essentials for card making and scrapbooking. 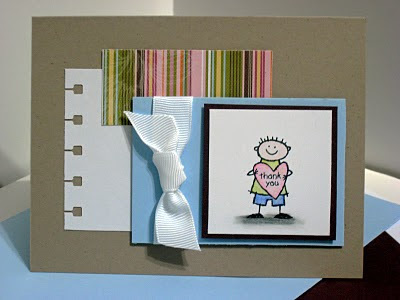 It has so many uses...a journal box, cut a photo into that shape, mat a photo, or mat an embellishment! I also used the hearts and brackets die for the heart and title on the page. I used the alphabet simple for my title. These dies can cut chipboard so they are a must have for any scrapbooker! The border punch can be used to make a border or, if you purchase the matching corner punch, you can cut a perfect mat. 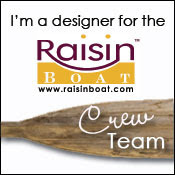 The designer papers all coordinate so that work is done for you! The 12X12 paper is the same high quality paper as the 8 1/2 X 11. I love the heavier weight to the paper. You can definiately notice a difference the minute you touch it! P.S. The designer paper used on this page is from the Ski Slope collection which has been retired. Posted by Karen at 6:49 AM 0 Click here to leave me a comment. Happy St. Patricks Day everyone! 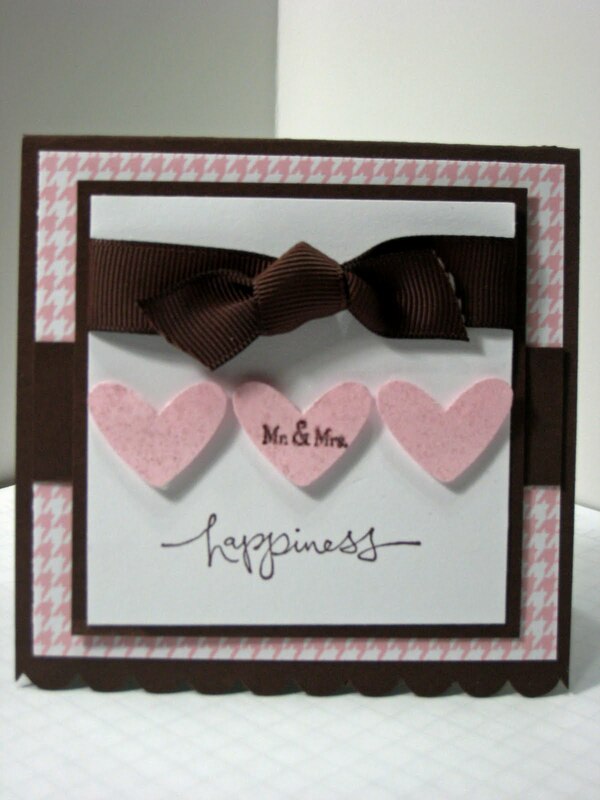 Todays card follows the weekly sketch from Karen Giron's blog...the Sweetest Thing. I love the layout of the sketch as it allows for lots of layers. 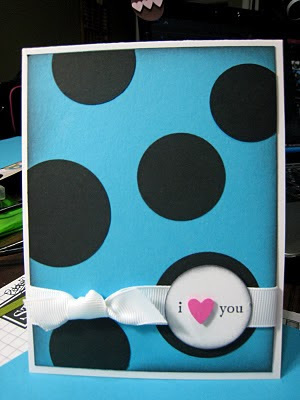 One of those layers was made using the dots embossing folder. It is so versatile and adds a little punch to any project. There are only two weeks left for Sale-a-bration. If you would like to place an order you can order directly from the link at the top of my blog. There are lots of really nice set as well a the border scallop punch you can get for free if you spend $50. Posted by Karen at 8:19 PM 2 Click here to leave me a comment. Hello friends! I have been MIA for a few days as we made a trip with some wonderful friends to the Tennessee mountains for a surprise birthday for my buddy Mr. Day. We had a great time and made lots of new friends. Can't wait to see them again. I totally forgot to post the Color Me Sunday Challenge on my Stampin Up group so I posted yesterday. Since we got home at 10:00 last night I had to wait until today to make my card. The color for this week is "Only Orange". 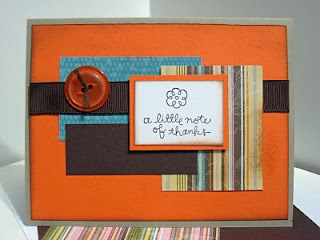 While I'm not a fan of orange at all, I pulled the other colors from the striped paper and followed this weeks sketch on the Stamping 411 blog. They have such great sketches over there and you can see what everyone creates from their links they upload. I am off to finish laundry and get everything put away. Posted by Karen at 9:42 PM 6 Click here to leave me a comment. I thought it would be appropriate to post this card today as I wanted to say a BIG Thank You to all who visited my blog yesterday and those who left comments! It was exciting to see all of the visitors and comments when I got home from work. Todays card is my own design. I was cleaning my craft table and pulled out a few scraps and thought I would put a few together and see what evolved. The only paper I cut was the cardstock the image is stamped on and the mat. I also punched the tabs down the side of the white. The stamp is in the "Very Thankful" stamp set and for everyone Stampin Up sells, they will donate $2 to the Ronald McDonald House! It's going to be a busy day today, work, errands, guitar lessons for my daughter and get ready for a photoshoot this weekend. Posted by Karen at 5:18 AM 2 Click here to leave me a comment. Good morning! 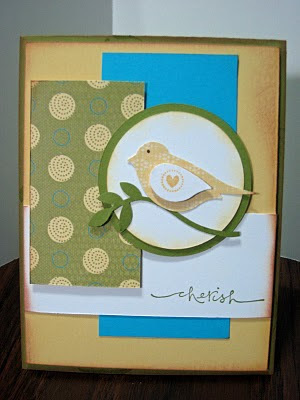 Todays card is inspired from the Stamping 411 blog. 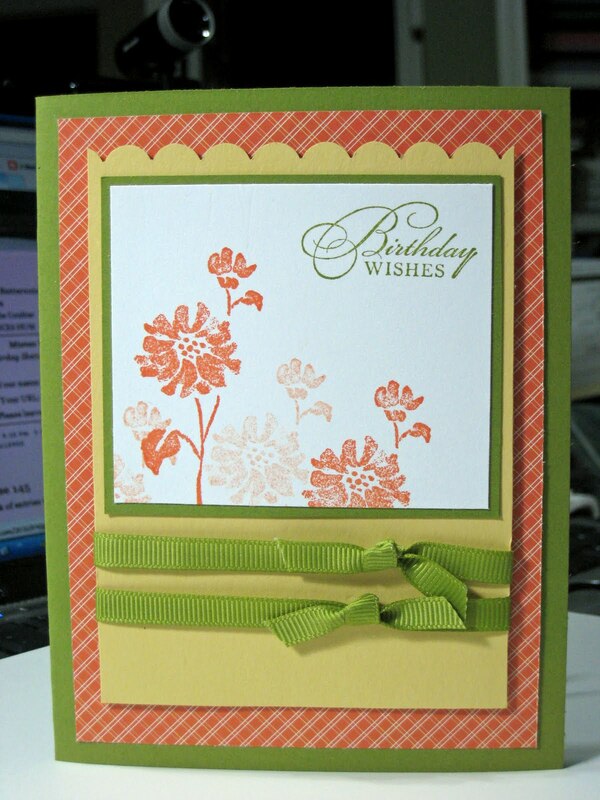 The design of the card base is quite unique with the rounded AND squared corners. It's definitely a sketch I'll use again. 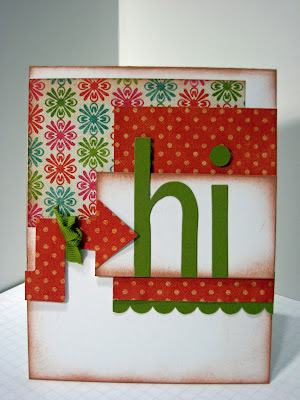 I chose some scraps I already had on my table and used the Fun and Fast Notes set from Stamping Up. I cut out the three flowers and used dimensionals which really makes the little bouquet of flowers. Next week I'll be working on my setup for photographing my cards so the lighting is better and you can see more detail. Posted by Karen at 5:29 AM 5 Click here to leave me a comment. It seems March is a busy month for birthdays! 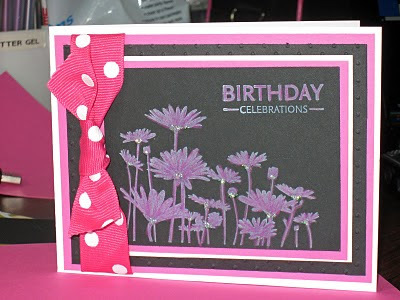 Today is my friend Shannon's birthday so I made her this card using Crushed Curry, one of the newest Stampin Up "In colors". 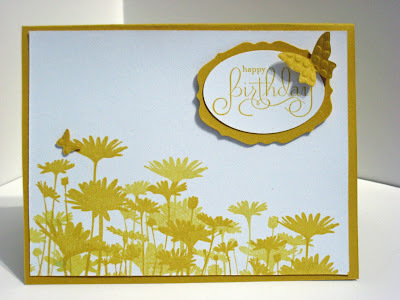 I stamped the daisys in crushed curry along the bottom of the card. I wanted a few more flowers to fill in between so I stamped off with the crushed curry which creates a nice dimensional look without being too busy. I finished the card by spraying with the Pearl Glimmer mist. Using the glimmer mist tends to warp the paper a bit if sprayed to heavily but Stampin Up has a new product coming out which I hope gives the same "sparkle" without the warp. I'll let you know when I try it out! Posted by Karen at 9:00 AM 2 Click here to leave me a comment. Todays card was inspired by a sketch I saw over at Karen Giron's blog. I am always up for new sketch ideas and this one gave me the idea to use the "congratulations" stamp in the Well Scripted Set. It's a long stamp, perfect for the saying for this card. I used my prisma color pencils with gamsol to color the flowers. Posted by Karen at 6:59 AM 3 Click here to leave me a comment. Today is Sunday which means a color challenge! This weeks color is Yo-Yo Yellow. I'm not big fan of primary yellow so this color was a struggle for me but when all else fails a bright colorful birthday card should get me through. I chose real red and a little garden green to compliment the yellow. I love the New Stampin Up Scallop Trim border punch! You can get it for free if you spend $50 during the Sale-a-Bration. I'm off to do some scrapbook pages and enjoy the rest of Sunday. Posted by Karen at 2:02 PM 0 Click here to leave me a comment. I am working on a collage for the wall in my daughters hang out room. She has her tv, chairs and "stuff" for her friends to hang out! I wanted to do a collage of pictures so we went for some random pieces she liked and decided to make a couple to go with them. 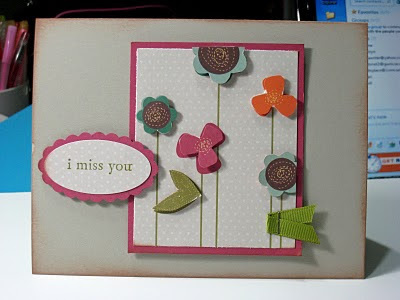 Here is the first piece I made using the Sweet Pea designer paper from Stampin Up and the Sweet Pea stitched felt! The pink and green match the room perfectly! I purchased the dimensional frame from a local craft store. 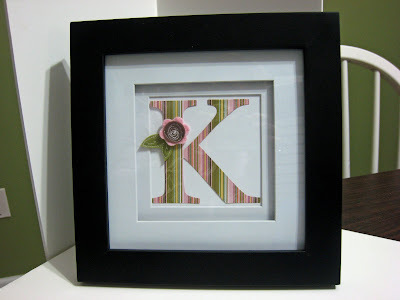 I cut the "K" using one of my sizzix dies! I have TONS of sizzix dies and use them regularly. Even though I have my cricut machine, I still keep going back to my dies, They are simple and quick to use so they won't be going anywhere anytime soon! Posted by Karen at 9:51 PM 2 Click here to leave me a comment. For this card I chose Perfect Plum, a beautiful shade of purple and stamped on the Shimmery cardstock (one of my favorite papers) it makes for a quite elegant card. 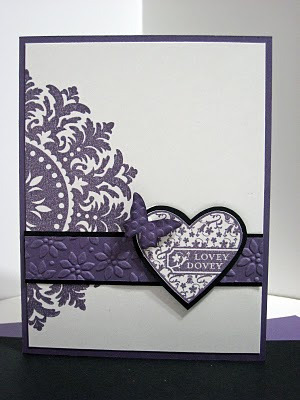 I embossed the perfect plum strip and used my new Beautiful Wings embosslit die. They not only cut the shape for you but they emboss it at the same time! NICE! Posted by Karen at 6:58 AM 5 Click here to leave me a comment. Thanks a bunch to everyone for my birthday wishes yesterday! I had a wonderful day! I made this card early this morning....I'm very creative early in the moring! lol This is a pretty simple card with a little added "Wow". I cut a hole the same size as the stamped image and placed the stamped image on the inside of the card and the hole allows it to show through to the front of the card. I embossed the front of the card and went back over the embossed images (tutorial coming soon) to make it a little more dramatic. The background looks like a really nice suede! It's ALMOST Friday! See you then! Posted by Karen at 6:53 PM 0 Click here to leave me a comment. I made this card for a friend who shares the same birthday as me! We met several years ago at a party (imagine that) on our birthdays and have so much in common....yorkies, bling, not acting our age, party girls, etc. I couldn't just make any card...it had to make a statement and this stamp does just that! The inside says "to me, old age is always fifteen years older than I am" and I would say that fits us both! The BIG Forty-Five! Yup, that's Happy Birthday to me. Do I feel a day over 29? No way! I like my distressed jeans and t-shirts, my pink and silver sparkly Converse, my gadgets (my license plate doesn't say Gadget Girl for nothing) and my daughter thinks I'm the coolest Mom! You can't beat that! Those of you that know me well know I have this thing for anything PINK! Clothes, jewelry, accessories, you name if it comes in pink I'll take one! The birthday card I made for me today just had to donn some pink so here you go! I had the little scrap of Olive Green polka dot design paper and decided to compliment it with Pretty in Pink. I have seen this layout made with four squares but thought it would be neat to do the three with the ribbon taking the place of the fourth square. What do you think? Posted by Karen at 12:01 AM 0 Click here to leave me a comment. Did the Bachelor pick the right girl? I never watch any of the shows except for the final rose. That's the only one that matters. I made this card while watching TV and video chatting with my sister. There are no special techniques, just a few dimensionals. 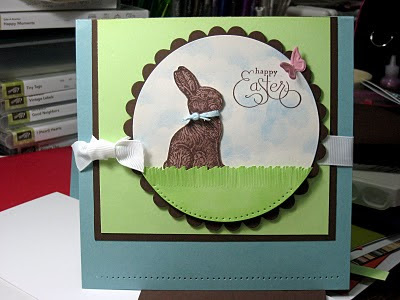 The base of the card was made to use on the Easter card I posted yesterday and then decided to use the smaller base. I love the simple and classic look. Posted by Karen at 10:18 PM 2 Click here to leave me a comment. 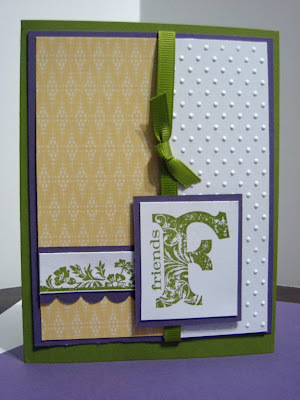 This weeks challenge on my demo blog uses the Stampin Up Color "Gable Green". Now this is probably one of my least favorite colors but I think it turned out really cute. I have embossed the bunny in clear embossing powder on Chocolate Chip Cardstock to make him look like a real chocolate bunny (Thanks Kathy) and then I used my scallop scissors and took a "bite" off of his ear (Thanks Keri). I cut a piece of Gable Green cardstock and cut individual blades of grass and went back and cut a few on the diagional. I also used my daubers and shaded a little Gable Green around the edge of the shimmery cardstock. I'll be working in my craftroom today as I have an album for hire to complete and plan or doing a little organizing along the way! It's a beautiful day outside so I hope to sneak out for just a bit! Posted by Karen at 11:13 AM 5 Click here to leave me a comment. Good morning everyone! I am actually making cards to SEND today! I make a ton of cards but most of them don't seem to find their way to the mailbox. I can "officially" use my two-step bird punch since my sister now has hers so I pulled it out first thing this morning to use on my card. 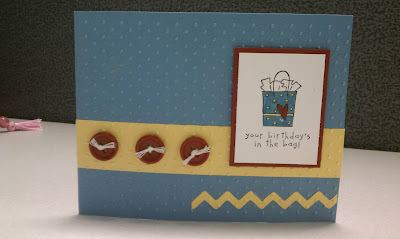 I really like the three different shapes on the card and the "triangle" placement on the card creates a nice collage. Don't forget my supply list is at the bottom of each post in the "Labels" section and if you have any questions, leave me a comment and I"ll get back to you. Posted by Karen at 9:26 AM 1 Click here to leave me a comment. What a Difference a Day Makes - Happy Easter! I went to bed after I finished my Happy Easter card last night and thought I had done such a good job on a simple little card. Well, that was last night. I got up this morning and got Katie off to school in the 28 degree Florida temperature and came up stairs to my humble craft room and took one look at the card and said to myself "WHAT WAS I THINKING???". I immediately pulled apart the card and ran that pink piece of cardstock through my dots embossing folder and reassembled the card and NOW it is the cutest little card! This is a perfect example of how changing one little thing can make a world of difference. Posted by Karen at 7:09 AM 2 Click here to leave me a comment. I don't know where Florida went but I sure wish it would come back! It has been chilly here all day and supposed to be in the twenties tonight! I am SO ready for spring and some nice weather! I'm glad they decided to make heaters for Florida because mine is cranking tonight! 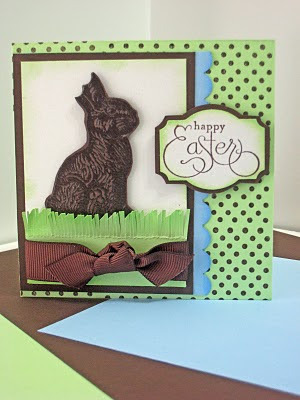 I thought I would spring into some warmer weather and make an Easter card with the Stampin Up Chocolate Bunny stamp I received today. He is too cute. I have a few other plans for a couple other projects so I"ll post them as soon as I get them done. 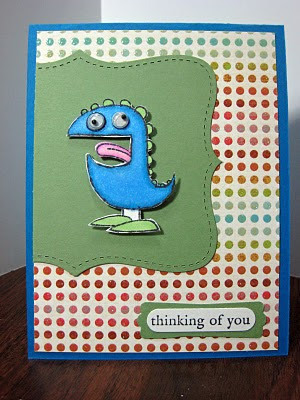 Here is the cute little card I made tonight.. TGIF tomorrow!!! Posted by Karen at 9:43 PM 2 Click here to leave me a comment. Happy Monday everyone! I left work on a dreary and rainy Monday afternoon and came home wondering what I was going to create today! I knew I had a package coming from Stampin Up so I checked the tracking and it was TODAY! I was so excited as it was the 2-step bird punch I have been waiting on for a month! Now my sister and a friend also ordered one so as SOON as I cut the tape on the box the phone rang! HOW did my sister know I was opening that box with the long awaited punches???????? 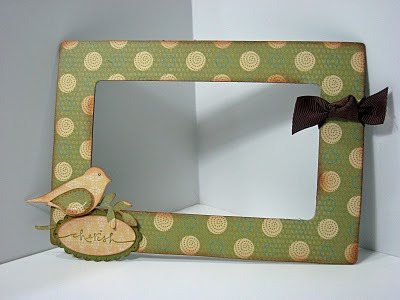 I covered the magnetic frame with Stampin Up Designer Paper and punched the bird from the reverse side. I used my paper piercer and pierced around the wing and scallop oval. See the Labels below for a full supply list. Posted by Karen at 7:30 PM 4 Click here to leave me a comment. Hi everyone! Sorry I missed you yesterday. The whole family spent the day shopping! Not alot of great deals out there but the weather was wonderful and our best mall is an outside Town Center so it made for a wonderful day of being outside in the beautiful Florida sun! It's even warmer outside today so after this post we are out again to soak up some more sun! 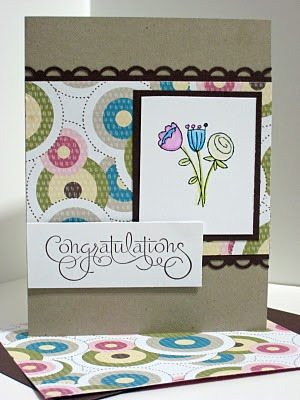 I am the coordinator for the Color Me Sunday Challenge in my Stampin Up demonstrator group. Each week I post a color from the wonderful selection of yummy Stampin Up colors and each member can take on the challenge of creating something that includes that color. It's a great motivator to use colors we don't reach for often and sometimes may even become a new favorite! For my card, I used Green Galore ink on the Green Galore cardstock and stamped the cupcake border in rows for the background. I then stamped three of the cupcakes on white, cut them out and used dimensionals and placed them over the tone on tone cupcakes in the background. I started to get REALLY energetic and cover EVERY cupcake but that will be another day! I'll post when I do as I think it will be really cool! If you want to follow along with the challenge, create something with Green Galore and post a link in the comments section. I'd love to see what you do with this weeks color! Posted by Karen at 10:55 AM 2 Click here to leave me a comment. Morning all! It's another chilly morning in Florida. I am certainly ready to see some Florida weather and green grass. I don't think I have seen a winter as cold as this one has been and it's not consistent, just when you think it is going to warm up it's freezing again. Here is a card that can be used for just about any occassion. I used my dauber and added the shading at the top of the white centerpiece and folded the butterfly so it would have more dimension. TGIF everyone and have a great day! Posted by Karen at 6:48 AM 1 Click here to leave me a comment. Good morning all! I made this little card using some of my Stampin Up dies and punches. 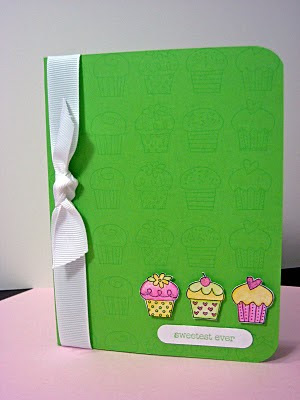 You can always see the stamp sets, colors and extras I use in the labels section at the bottom of my post. Don't forget if you ever have a question you can post it in the comments section and I'll get back to you as soon as I can! Posted by Karen at 7:06 AM 0 Click here to leave me a comment. Creating sincere cards is not an easy task. It requires the right colors, theme and saying. I have created this card to send to a friend going through a rough time. 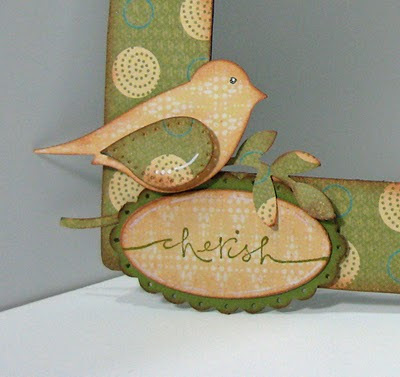 The bird is a little cheerful but not "cutesy" and the sentiment is just what I was looking for. I like to have several of these types of cards on hand so they are ready when I need them. Posted by Karen at 10:49 PM 2 Click here to leave me a comment. Welcome to Karen's Kraft Room! Hello fellow crafters! Welcome to my new blog. 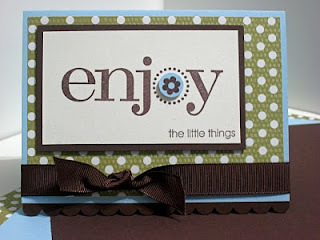 Here you will find exciting new projects, information about upcoming events, classes and Stampin Up promotions. Projects - I will be posting projects I create, some will be accompanied by a tutorial so you can make them at home. Events & Classes - I will let you know of upcoming classes I have scheduled so you can sign up and create along with me. Stampin Up Promotions - Always be in the know of the latest promotions from Stampin Up! I have posted the current two to the right along with the current catalog for your convenience! You can also place a direct order using the link at the top "Shop Stampin Up". If you have any questions you can also email me from the link above. Posted by Karen at 8:13 PM 4 Click here to leave me a comment.